Children of the Nile is the next-generation in strategy and building games. You are the Pharaoh of ancient Egypt -- strive to become a lordly ruler whose word is law, while guiding your people from primitive hunter-gatherers to Your overseers will supervise large-scale labor operations from mining to constructing massive monuments to your glory. Make sure the priests provide services to your citizens, and keep your military strong to prevent outside threats. As people begin to believe in your dynasty, you'll have a chance to create the greatest civilization of the ancient world. Picked this up over the weekend after gamestop ran out of RCT3. I have to admit that I've been surprised by what I first thought was just going to be simcity egypt. After going through the tutorials (good luck if you don't), it's easy enough to get a sizeable city going, but building pyramids requires planning and strategy, which I've found to be challenging and fun. In the style of the many city-building games that came before it, Children of the Nile lets you create homes, shops and estates in classic Egypt. First, I am a huge fan of city building games in general. I have spent countless hours laying out roads, adding in plazas, watching with glee as the homes upgraded and the people became more and more happy. I do have to say that the graphics in this game are pretty impressive. You can zoom out to an overview level to watch your city's progress, or zoom in to such a level that you can see the individual flowers. Each home, person and land formation is clear and identifiable. However, the gameplay itself is extremely slow. I have very high end systems here so it's not that my system was "slow". It's just that the gameplay *is* slow. You request something, and then sit around for quite a while waiting for it to happen. Adding to the sense of time going slowly is the game clock. It isn't even ticking by day after day. It ticks by *minute by minute* which makes little sense for a game that spans years. You have three seasons, and a certain number of days per season. The minutes going by make it seem sim-like, but of course the actual timeline doesn't quite make sense. As far as the AI goes, this game goes for the family approach. Each household has a male, female and child. The male tends to do whatever the "job" of the household is (farming, making bricks, etc). The woman has to go out from shop to shop, buying household necessities. In some homes she also has to do the crafts. The child either helps with work, or runs off to school. The game is pretty straightforward in its chain of commerce. You put the brick maker near the clay. You put the brick layer partway between the brick maker and where the brick homes will be built. You build shops nearby so the wives don't have to go far to shop. I realize that the game has to be slow for beginners, but even the fastest speed still trudges along at a crawl. If you really set it on the slowest setting, you could go eat lunch before anything began to happen! Zooming in and out of every part of your town only keeps you occupied for so long. City Builder: The Next Generation! There's a kind of game called "city builders" that started with Sim-City years ago, made a big jump in something called Caesar III, and continued on through Zeus and Emperor. You build... well, CITIES... but it's fun and they're historical in cool time periods etc. Children of the Nile is the inheritor of this tradition but it's made a big jump. It's 3 dimensional, people-oriented, thought-provoking, scenic, engaging, and FUN. Think "Sims3 meets Pharaoh" and you're sort of in the ball park. If you've never played a city-builder, try this one. If you've played city-builders and have been looking for something new and next-generation, try this one. The only needing 1 CD for a 3D game in this day and age should have turned me off of the idea (Pharaoh only needed 1 CD too) but instead I pushed ahead with it. In NO WAY does this resemble any of the famous predecessor games, Caesar III or Pharaoh or Zeus-Master of Olympus. For one part, the user interface is abysmally clunky, with building options opening up from the side, crowding up much of the screen, and needing to be clicked AGAIN in order to close it up. Building placement is awkward, and roads are seemingly useless, as it doesn't matter where you place buildings, because people will reach them regardless. Next, immigration. Rather than simply building housing for your people, you have to build INDIVIDUAL buildings, which house only one working man, his wife and single child. Also, you have to build the houses for shopkeepers, as they apparently work out of the home, and have to constantly build new ones to add variety to every area of your city. All other buildings save these require bricks to be built, so you must build a brickmaker AND a bricklayer (both act as houses and work areas) and the game itself even admits that bricklayers are lazy and won't deliver bricks anywhere unless it's close by! Thus, you have to build brickmakers and layers almost everywhere. Made even worse is that the more advanced buildings (such as temples and the like) require educated priests trained at a school, and just getting a single priest to come to the city to work at the school is a hassle! Even then, they have insanely important tasks to perform rather than teach, such as dealing with medicine and hospitals, courting the Gods, etc! If you liked the old impression city builders you will love this one too! Amazing graphics of your city now fully in 3D so you can walk with your people on a leisure stroll or look at them while they do every days work. You can here them talk as there are more than a thousand lines in the game! You can do so many great things like building pyramids with a totally new infrastructure system that doesn't need roads. In the older games you only had the walkers to upkeep the infrastructure but now you got famalies with three people in each and a lot of them and all these people will struggel every day for food and goods they need. At first this gameplay seems a bit strange but if you play it a bit you will easy attach and will see that it is very interesting to layout a city that doen't depend on roads like in the old games but on a more flutend structure this time. You can build fantastic monuments and wage war aggainst opponents on the world map and by this achieve great your place in egyptian history! I've played numerous simulation and strategy games, but none have impressed me as much as 'Children of the Nile'. The graphics is in 3D with excellent detail and you have complete control over the camera views. Zoom down and watch your 'children' move from place to place carrying wares, soldiers running to the training grounds or watching the 'children' dance in the streets. I had a very hard time walking away from the game once I got started and the more I played, the more experienced I became at managing the senarios. There are a few minor flaws, such as clipping, or some annoying 'stuck' children, but the technical support has been awesome! They were very receptive to the customer and quickly provided fixes after the game was released. I heard that people were having trouble understanding the recently released game Children of the Nile, so i got it to see what all the fuss was about. Immediately, I noticed the immense complexity of this game, with its almost esoteric understandings of how a real city is maintained: the wide selection of buildings and societies to construct, the connection between economy and the seasons, and the self-sustaining animated people that roam around your city shouting out their likes and gripes about how you're running the place, all make this game seem almost real. Although this makes the game seem frustrating and overwhelming, it can be easily digested by just simplifying it all in your head. I.E. : Don't try building the pyramid as soon as you control a stable civilization, carefully plan ahead: Do I have enough supplies to build it? Do I have enough workers to build it? Will I have enough supplies after the construction is complete? Etc. I enjoyed this game very much, with no real difficulties in the tutorials and the first campaign. It's true, this is a hard game, but it wouldn't be much if it were easy. It has all the real life components in running a city, which separates itself from other games such as Age of Empires and Commanding Conquerors, which are so concentrated on fighting and destroying other cities that they leave out the key ingredients to a good real time game: the actual city. No doubt most of the readers have played one of the SimCity games. Just apply the skills from that game to this new awesome version of those games set in ancient Egypt. I don't think it can get much simpler. I purchased Children of the Nile as I am a fan of city builder/management games. This game contains most if not all of the challenges that one would expect to face in a real life city during that time period. Some of these challenges include: military threats, over all economic management, taxes and trade, healthcare, religious issues, vagrancy, protests, and the use of propaganda. I did notice that the threat of fire is not present at all during the game for the most part. Over all, the game runs smooth on my particular system and I have had no problems with the game software. It is a time consuming game but I do find it fun and challenging. If your looking for military action then this game may not be for you. Your job, as Pharaoh, is to build your Commander's house, soldier's barracks, training ground, and weapons makers. The overall military action, strategy and training of solders is carried out by your Army Commander. I hadn't really tried city building games much before this came out (I never seemed to get on with SimCity and gave up), but this is my favourite game after the Stronghold series. I love watching the city develop over time and, although I like a good battle now and again (which is why I like Stronghold), it's nice not to have combat as the main purpose of the game. At last someone has realised that no all of us want to spend all our gaming time bashing someone's brains out! I enjoyed playing this so much I actually purchased a gold edition of Pharaoh, but boy do I wish I hadn't! I've gotten so frustrated with it that I've taken it off my machine. If you play Children of the Nile you should never want to go back to ramdon (irritating) walkers and roadblocks. I've had no problems running the game on an Acer Aspire computer that's two and a half years old and I found the manual and tutorial gave me a good grounding to get on with the game. I do agree that the scenario editor is formidable; I suppose it's because of the 3D side of things, but I've looked at it once or twice and couldn't make head nor tail of it. As for moans that women only shop, well quite a few of them actually work as well (common craftshops, entertainers, farmers and servants). I have had a few people occasionally getting stuck, mostly incoming traders, but that's a minor problem. I just wish the scenario editor was easier to get along with because I want more, more, MORE! Maximum system requirements are recommended!!!!!! I just got this game so I haven't actually played it much. BUT I wanted to report that it was quite difficult to even get it to play on my P3 system (xp w/ 256ram) & I have read that others have the same problem. It seems that the minimum system requirements are really too low to play the game at it's best. So, if you don't have a P4 2.0 ghz with at least 512 mb of Ram, you may have to tweak your computer a bit (close out all running programs & maximize your performance, minimize appearance) as well as the computer game (drop the music & lower graphic quality), otherwise the game may not run at all or work well. As it is right now, I am finally able to use the program & I am quite satisfied with the reduced graphics but I am honestly not very interested in those aspects of this game. I am an Impressions fan, interested in the depth of the city-building concepts rather than graphics/3d,etc. So, if you are hoping for awesome graphics & music you will have to have the maximum requirements for this game. It does appear to be a very fun game, it seems to be quite different from the Impressions city building games though. At first glance it reminds me a lot of the Tropico or Sim series' rather than Pharoah, Caesar & Emperor. I should have listened. . .
Like all of the others, the game is very slow, even at its top speed, but that's not what turns me off to it. It's incredibly frustrating: you need priests and other graduates in your city to perform tasks the plebians cannot, and you can only entice them to come if you have enough prestige, which is about as easy to gain as gold from a silver mine. Therefore, you have a city of angry people no matter what they are upset about (ie. can't worship a god when there are about 50 plus open temples... or get proper healthcare when there is a like amount of open hospitals and apothecaries as the temples), and seeing as how none of them will ever be happy, what little prestige you happened to have falls, and the few educated move out of your city; hindering your game play even further. Seeing as how I lost my Pharaoh CD, it was the only reason I bought Immortal Cities, and ever since I have been trying to find Pharaoh again. The only plus to Immortal Cities, is the fact that you do not use money as you do in Pharaoh; it gives a more accurate portrayal by using food as the currency. That, as far as I can tell (aside from the zoom and lovely water grafics) is its only redeeming quality. Love Game--Hate the glich that makes my computer restart. If you enjoy city building games, and you are into egyptian history, this is the best game in my opinion. I have had this game since it came out, and I always find myself playing it over and over again. The graphics are amazing and the realtime action makes you feel like you are actually there building and cultivating this growing thriving city. There is so much to do the options are endless. 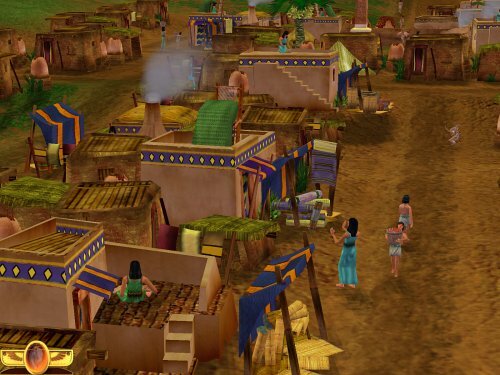 I've played many sim programs, and Children of the Nile is a good example of a well designed and implemented sim game. There are many different goals involved in the campaigns, each requiring a different approach to your civilization building to attain them. Scenario goals can involve prestige, trade, politics, religion, conquest, etc... either alone or in some combination. COTN does not run itself, it's a hands on, micro management type of sim where the player has to constantly evaluate and adjust all aspects of the game to keep everything on an even keel. I disabled some of the "gee-whiz" graphics (my vid/sound card is just 256MB) and got good gameplay speed, without sacrificing the visuals... even running at max game speed. The AI and logic behind the game is excellent. As you try different strategies, you can see the results... good or bad. The more you play, the more successful you are at controlling the game and meeting the goals. I reccommend COTN highly, for a good test of strategy development, plenty of "civ" managemnt, and... hours of fun. "Immortal Cities" is designed by Chris Beatrice, who also designed "Pharoah/Cleopatra". This game does have stunning 3D graphics. The animations are nice. The interface is a little less than perfect. But the biggest problem, in my opinion, is gameplay speed: even on the fast speed, gameplay is slow. I sat around twidling my thumbs a lot while waiting for enough stored food or stored bricks (or other resources) so that some project or building could begin. I have a 2GHz machine, and turned down the graphics quality etc, but the game is not an action-packed game. "Pharoah/Cleopatra" had more ability to keep my interest despite the more cartoony graphics. The manual gives a good introduction to the game, and the in-game help is great. You can trade resources in this game, but each trade partner city only offers one resource, unlike "Pharoah/Cleopatra" where multiple trade items were available in each city. There are also only 5 games to the campaign instead of the dozens of campaign levels in "Pharoah/Cleopatra". The characters do have lots of silly little lines as they talk to each other, but that gets old pretty quick and you'll turn them off. I wouldn't compare this game to "The Sims" at all .. you have no control over specifically what each person says or does. The best you can do is toggle a specialty. Yes there are families, but the wife basically does the shopping, the kid gathers resources, and the father creates the resources. In the end, this is still a "walker" kind of game .. the priest walks from his home to go shopping, then goes to the temple or hospital to perform his services, etc...essentially the same as "Pharaoh/Cleopatra". The AI routines for the little people are nice, which is good because you'll be spending a lot of time watching the people while you wait for other things to happen. You do a lot of watching, which makes the game less exciting. Minimum System specs: Pentium 3 - 800MHz or higher. Windows 98/2000/ME/XP. 128MB RAM. 1.1Gigabytes uncompressed harddrive space. DirectX 9.0b compatible video card with 32MB memory and compatible sound card with 16bit sound. Recommended specs: Pentium 4 - 2.0GHz processor. 512MB RAM. 64MB video card with full DirectX9.0 support. The game is rated "E" for Mild Violence. The violence comes from two sources: fighting and killing the wild animals that attack, and fighting and killing the human raiders or enemies. This game is supposed to be the "improved" version of Pharaoah, which was a terriffic game IMHO, but was a flat, two dimensional plane game. I hate how they're taking these games (like Roller Coaster Tycoon) and making them three dimensional when the three dimensionality only makes it more difficult to maneuver across the terrain.